Hair Replacement | Stylistic Inc. Many women face hair loss at some point in their life but rarely understand why. There are some common causes of hair loss for women and it’s important to recognize them. Below, we have compiled a list of common reasons that make women experience hair loss. 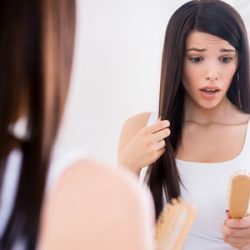 If you are a women that struggles with an overactive thyroid, you should be aware that hair loss can be a common side effect. An overactive thyroid will often cause hair to thin out and halt the hair growth cycle. If you are aware that you have an overactive thyroid and you’re experiencing hair loss, the two are likely related. Although it is important to wash your hair and keep it clean on a regular basis, washing your hair too frequently can cause hair loss .We all lose hair on our head on a regular basis whether we are showering, blow drying, or simply combing our fingers through it. However, if you notice a significant amount of hair disappearing, specifically after you shower, it could be because you wash your hair too frequently. Some products are harsh on hair and if they are used too often, they can lead to breakage and hair loss. Stress can have horrible effects on your body and hair loss is a major result of high stress levels. Stress can contribute to fluctuating hormones, which can affect our overall well-being. If you are experiencing something in your life that has you frequently worried or anxious, your hair could be falling out as a result. When women are pregnant, they often experience the “glow” that is commonly associated with pregnancy. Pregnant women’s hair and nails often are strong and shiny during pregnancy. However, after the baby is delivered, hormones start to change and find a new balance. Hair loss is common for women that recently experienced a pregnancy. When women experience menopause their body changes in a significant amount of ways, both mentally and physically. Prior to menopause, women are often protected from hair loss by their hormones. However, during or following menopause, hormone levels decline, often resulting in hair loss. If you experience hair loss, it is important to contact your doctor and get answers. There are many options, from hair replacement to wigs that can help you feel confident following hair loss. 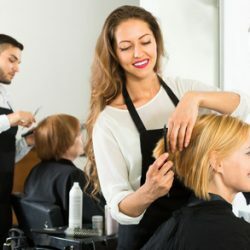 For information on hair replacement and wig options, contact Stylistics, Inc.
Why is it So Important to Work with a Stylist Who Knows Hair Replacement?